A couple of years ago, Dustin got a sponsorship offer from Fluid Recovery (now they also have a Performance line) on hookit.com. He asked for samples to try and he seemed to like it a lot. I was training for my first marathon and had a 23 mile run. He saw me on his way home from work – I was struggling! I felt like I had run all over New Orleans that day. I got back to his house and I think I slightly died on his patio, he came out and said “drink this”. It was something from his little bullet blender: icy, frothy, and I was like “what’s this?” I looked at him with doubt and said okay, seriously, I was hurting so what could hurt me at this point?! I was amazed the next day at how I felt! I thought for sure that I’d be with muscle aches and pains the next day… not so much! Taste was good (Tropical Escape is my favorite, but they’re all good), it was light, frothy, and worked! So ever since then, I’ve been a believer and ever since then, I’ve been a Fluid pusher!! haha. I have also been fortunate enough to be an Ambassador for this amazing company that always seems to put the personal touch on everything! So I thought who better to tell you about how it works and the label than from the company’s own web-site, www.livefluid.com! 2. Fluid supplies muscles with ultra pure whey protein isolate and 2500mgof muscle supporting L-Glutamine. 3. Fluid prevents aches, pains, and soreness associated with exercise by stopping inflammation before it starts. 4. Fluid replenishes the body with electrolytes and provides immune boosting Vitamin C.
Fluid also combines ingredients that are synergistic and provide more benefit than taking them individually. This helps you recover faster, and come back stronger. Artificial flavors, and it never will. 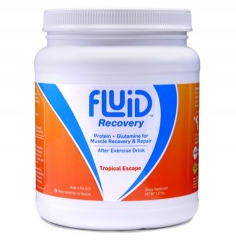 Take Fluid after your next workout and experience better recovery! So there you have it, it’s pretty basic ingredients that aid in recovering swiftly so you can give it you’re all the next day. It’s more important to me now than ever as I’ve upped my endurance distances! It kept me going through my Ironman Texas training after those long, hard training rides on the Natchez Trace, long swims, long runs, what sometimes seemed like endless 2 a days. Now that I am full swing Goofy mode in training for my first 13.1+26.2 in two days at Disney in January, it’s going to be even more important to focus on recovery! Let’s face it, as a triathlete, you’re joints can get a little break from your body weight but as a runner in the winter, there is no option and that L-Glutamine and Protein will help me and my aging joints…. and muscles….. okay, let’s just say body! 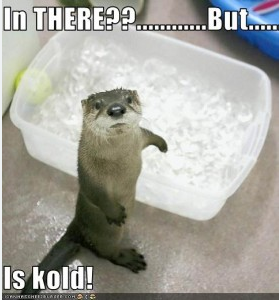 Now, in addition to Fluid, I do like me an ICE BATH…. and I don’t bundle up… I get in, have my fluid… and occasionally I have a party in the tub – meaning…… I take a beer or two…. one can float and one can be drank. I’ve learned this helps me pass time quicker and they don’t warm up (my parents would be proud). Stretching is also key and I’ll be honest, I don’t do it enough but I’m trying!!! I really want a pair of Recovery Pump boots at some point to add in to this rotation! So, I always like to know whats out there (even if I’m kind of in love with the miracle of Fluid). What all are you using for recovery?! Any special tricks you’d like to share?